Students are looking for the premium notes of 10th Class Chemistry for the Punjab Board and the solution of Carvan Book, then you have come to the right place. The solution of examples is also included in the notes, so you don't need to spend extra money on the Chemistry guide. We are providing notes with a different approach - you can download directly or even read online. If you face a problem in clearing concepts then make use of Youtube, Sabaq.pk or Google Image. Differentiate between irreversible reaction and reversible reaction. What are irreversible reactions? Give few characteristics of them. Why at equilibrium state reaction does not stop? A solution of hydrochloric acid is 0.02M. What is its pH value? Write a note on types of salt? What are indicators, universal indicators, and pH meter? Explain Lewis Concept of Acids and Bases with examples. What do you know about Stomach acidity? Milk has an acid called lactic acid. What are functional groups? Give an example of Ketonic Group, Aldehydic Grup, And Carboxyl Group. Who rejected the vital force theory and how? What is dot and cross formula? Define aromatic compound. Give an example. What is the difference between n-propyl and isopropyl? Write down two ways you can prepare Alkanes with? Write the preparation of Alkenes? Write the uses of ethene? Differentiate between saturated and unsaturated hydrocarbons? Why the alkanes are used as fuel? Give the classification of carbodhyes. Write a note of Green House Effect? What is the difference between primary and secondary pollution? How acid rain is produced? Justify ozone is beneficial to human beings. 99% of the atmosphere is made up of oxygen and nitrogen. How polarity of water molecular plays its role to dissolve the substance? Why water is considered to tbe universal solvent? How temporary hardness is removed by Clark's method? 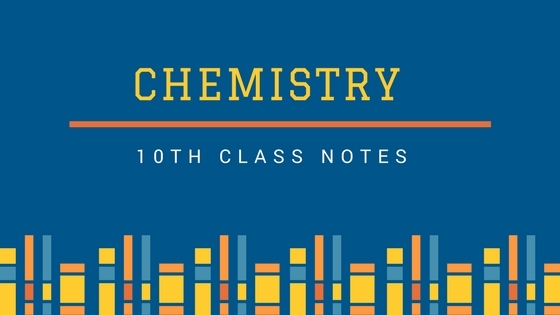 Here you can download FREE 10th class Chemistry notes in PDF for the Punjab Board students, and the solution of Carvan Book, and you can view online without downloading anything. One of the best notes you can find ever.